Der Jazzpianist aus der Ukraine im Trio spielt mit dem Bassisten Don Loomis und dem Drummer Ronen Itzik. „Pianistic Power Station“ - so nennt ihn die Presse. 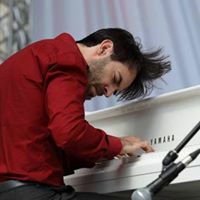 Last May, the Ukrainian pianist Vadim Neselovskyi released his trio's debut recording Get Up and Go (May 19, Jazz Family and Neuklang Records) with bassist Dan Loomis and drummer Ronen Itzik, and the three musicians have been burning up stages around the world ever since. Their spring performance at jazzahead! 2017 in Bremen, Germany is a perfect example.Neselovskyi's precision and technical skill, honed during years of studying classical piano, work hand in glove with his creative compositions and brilliant improvisations. He's a passionate, fierce performer whose rapport with his bandmates is evident at every turn. The performance offers a satisfying view of the close musical communication between Neselovskyi, Loomis, and Itzik. The album shows off the range of emotions this trio is able to summon, as well shining a spotlight on Neselovskyi's compositional gifts, allowing him to conjure a remarkable symphonic sweep from such limited instrumentation.